Wittenberg was central in the Protestant Reformation of the 16th century. This little medieval town was where Martin Luther's 95 Theses were nailed to the doors of the Castle Church, where you can now visit his tomb. You can visit Luther's House, an old cloister, and Lucas Cranach's art studio. Cranach is known in art history for his portraiture and woodcuts. Every June and October, medieval fairs - the Luthers Hochzeit and the Reformations Fest - feature music and cultural events. 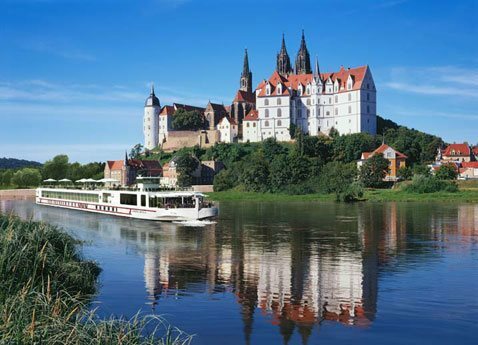 Meissen is known as the "cradle" of saxony. The town's beautiful stone buildings display different time periods in Saxon as well as Holy Roman Empire history. The Albrechtsburg Castle was the first royal residence in Germany and is currently a museum for visitors to tour. Discover all that the German spa town, Bad Schandau, has to offer. Located in the center of the Elbe Sandstone Mountains, stunning views can be enjoyed all around town. From extensive walking paths for all levels, cycling, climbing, water activities, to dancing… there is something for everyone to enjoy. See the sights on the historic electrical Kirnitzschtal tram, dating back to 1898, connecting Bad Schandau town centre to the Kirnitzsch Valley. Walk or cycle along the river promendade, visit the botanical gardens, relax at the spa gardens and of course visit the therapeutic health and spa facilities that Bad Schandau is known for. Decin is the economical and cultural center of a scenic tourist region. The area is known for its deep valleys and rock formations. The Decin Chateau is located in the center of town and is one of the biggest and historically important of its kind in the Czech Republic. The Chateau has been renovated several times and is currently in Baroque-Classical style. The Decin Zoo offers visitors a peaceful and pleasant atmoshpere for a trip into the animal kingdom.